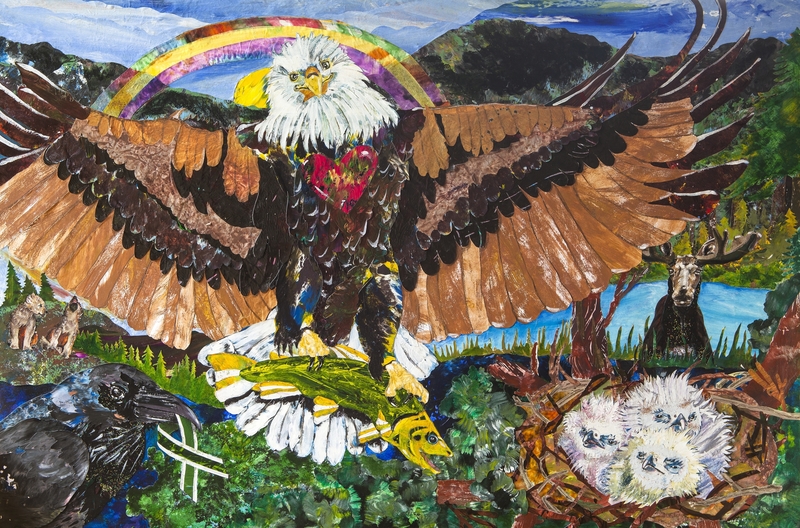 Totem designs, recreated by young artists in Connecticut. What an exciting morning with the Newtown Totems at school yesterday! Two months after our Kids Share Workshop in early April, Kristina went home with the children’s art direction ideas and a large stack of paper art to execute the illustration above. Paper art from previous workshops; Vermont, Nicaragua, Guatemala, Costa Rica and 2013 Newtown workshop were used in this illustration as well. Not all elements can be included, but the most popular ones were. Children had the opportunity to ask questions and make comments about the co-created illustration. Each child wrote a paragraph or more about their totem animal. During our presentation five children had the opportunity to read their stories to everyone. Soon, Kristina will assemble a book for everyone to enjoy, and have fond memories of our creative team work. The principal at the school, who attended as well, told Kristina that they are very proud to have this piece to display at the school, especially since the children had a hand in its creation. He also mentioned, what a successful workshop this had been, and was impressed with the stories that the children had written. Kristina and her Kids Share volunteer team hope to move up the the Intermediate and Middle Schools in the fall of 2015. 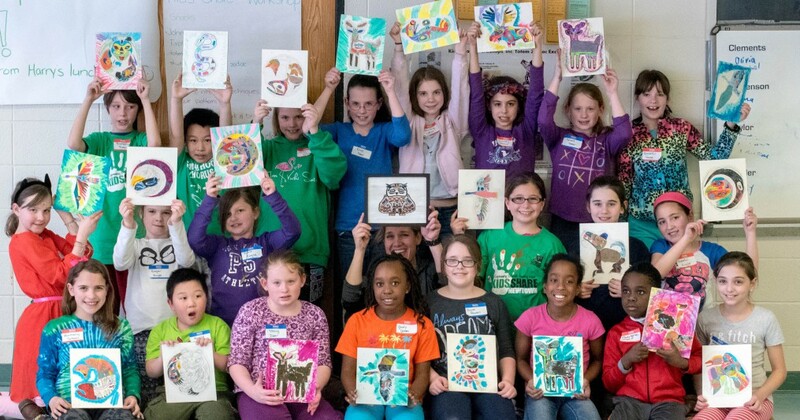 Many of the fourth graders who had participated as second graders in the 2013 Newtown Kids Share Workshops, will hopefully join Kids Share again for more creative fun. *Our excellent photographer was Mai Wong, parent and volunteer. Thank you Mai! ← Mascot Illustration Sneak Peak! Kids Share Workshops Main Website This is our main website where we update frequently. You can also see past workshops here since 2008.